Real Madrid manager Jose Mourinho has questioned his side's commitment just two days before they meet Manchester City in the Champions League. The Spanish champions have slipped eight points behind leaders Barcelona after Saturday's 1-0 defeat at Sevilla. 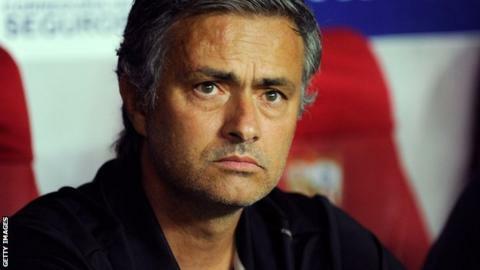 Mourinho said: "We have only really played well in the Spanish Super Cup. Nowhere else. I am worried that in this moment I don't have a team. "There are very few heads who are committed and concentrated." Nine-times European champions Real play host to City in their opening group game of this season's Champions League on Tuesday. Mourinho added: "When you don't have people who are committed, it's tough. "But I am the coach, and if there are people who aren't committed it is my fault." Barcelona, who Real beat to win the Spanish Super Cup in August, cruised past Getafe 4-1 to maintain their 100% league record this season. Real, who began their campaign with a 1-1 draw at home to Valencia before losing to Getafe and beating Granada, conceded a goal after only two minutes against Sevilla when Piotr Trochowski volleyed home. And Mourinho had no complaints about the result. "Congratulations to Sevilla, they deserved to win without any doubt," said the former Chelsea boss. "We got the prize we deserved considering how badly we played. "At the break, I changed two players but I wanted to change seven. "The image of my team at this moment is a team without concentration, without the willingness to compete. "For Sevilla, every ball was the last one in their life. They played with perfect aggression in everything. They wanted to play quickly, move the ball quickly. "My team did it against Barcelona and haven't done it in any other game." Mourinho refused to blame Cristiano Ronaldo for his side's early-season wobbles. The world's most expensive player said he felt "sad" for "professional reasons" following the win over Granada. "It's got nothing to do with the rumour of the last two weeks," said Mourinho. "I don't think today was any different to the games we played against Getafe or Granada. To me, it's to do with the collective spirit." Why is Ronaldo 'sad' at Madrid? Read more on Why is Ronaldo 'sad' at Madrid?